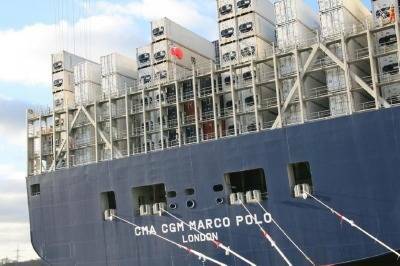 The 175,343 gt 'CMA CGM Marco Polo' owned by CMA CGM Group joins the UK ship register. The first in a series of three new 16,000 TEU container ships, for the CMA CGM group to serve on the Asia-Europe routes, the ship was built in Korea by Daewoo Shipbuilding & Marine Engineering Co Ltd, and is almost a quarter of a mile long. The new vessel is also designed with cutting edge technology for high levels of performance, safety and environmental protection. Features include a mid-ship deckhouse, an electronic-injection engine that sharply reduces oil and fuel consumption, fuel tanks protected by a double hull, a Fast Oil Recovery System, a Pre-Swirl Stator, and a twisted leading edge rudder. It also features an all-new, chemical-free ballast water treatment system that protects marine ecosystems by limiting the transfer of micro-organisms from ocean to ocean. I am delighted to welcome CMA CGM Marco Polo onto the UK Ship Register, particularly as it is now the largest vessel we have. It is also pleasing to see that our good relationship with CMA CGM continues to bear excellent results and I hope we can continue to do so together in future.